I was Art Director at Polydor Records from 1976 to 1979. From 1979 I worked freelance in the music industry throughout the 1980s. There was plenty of inspiration for my work from the great music that was around then. As well as designing record covers, posters and promotional material I also illustrated for the New Musical Express, Melody Maker, Vogue and Tatler. Images on this site are the copyright of Jill Mumford. Their sale is restricted to private use and they may not be printed, copied, distributed, published or used for any commercial purpose without written consent. To obtain consent for any of the above please contact Jill Mumford. Limited edition of 100 signed and numbered giclée prints. £65 + p&p. Printed image size 42.4 cm x 46 cm. 1978. The home made silk-screened poster that this print is taken from was a small run, we think about 15, to promote the new single. 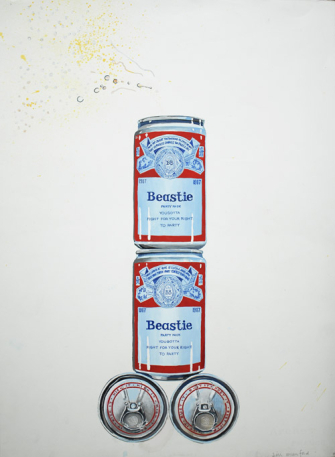 Phillip Sheffield is the silk-screen artist. 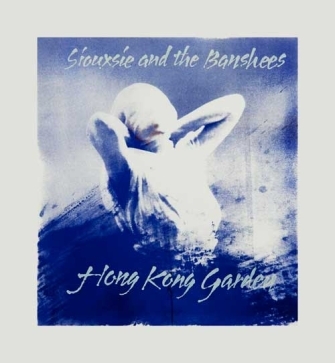 The single Hong Kong Garden was their first release at Polydor Records where I worked as an Art Director. I designed the sleeve with the band. My Hornsey Art college tutor Sid Day did the wonderful calligraphy lettering. The Banshees brought in the image of Rose Lemoine, the ‘Gibson Girl’ from the Charles Addam’s book ‘Dear Dead Days’. I also worked as Art Director on the album ‘The Scream’ with the Banshees and their manager Nils. Limited edition of 50 signed and numbered giclée prints. £65 + p&p. Printed image size 30 cm x 30 cm. 5mm border. 1979. 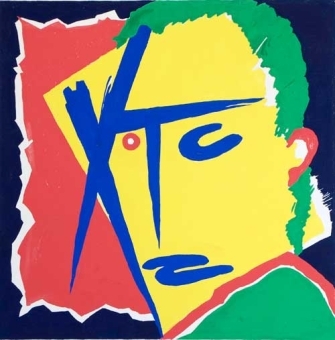 The original idea of making a ‘tribal’ face from the letters XTC was given to me at the first meeting with Andy Partridge. I scribbled a face on a cigarette packet at the meeting and he said that he wanted it in primary colours. I made this preliminary painting to work out the colours I would use. The camera-ready artwork was made by painting black shapes on film layers, then giving instructions to the printer. This camera ready artwork is now lost but this painting showing the colour work out remains. 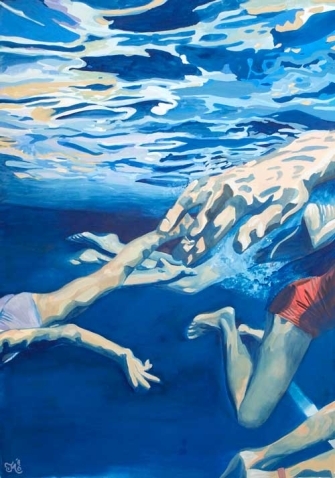 Limited editions of 50 signed and numbered giclée prints. Individual Printed image sizes 30 cm x 42 cm. Three together Printed image size 90 cm x 42 cm. 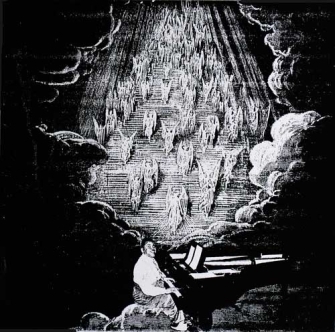 These black and white drawings were commissioned by Neil Spencer, editor of the New Musical Express to illustrate the review of the new Public Image Album, Metal Box in November 1979. They were drawn from ‘funhouse mirror’ photographs. It was Keith’s idea to make use of mirrored card to make the pictures. £65 + p&p. Black and white on paper. Printed image size 26 cm x 27 cm. 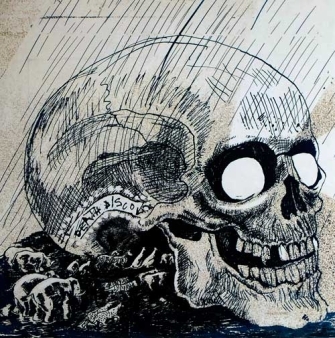 This drawing was commissioned by Richard Williams, editor of Melody Maker for the P.I.L. release of the same name. Limited edition of 50 signed and numbered giclée prints available. £65 + p&p. Printed image size 28.5 cm x 40 cm. 1987. Watercolour and airbrush on paper. This work was commissioned by the NME for its Xmas issue. The artist was given a whole page and free reign to illustrate the song. £65 + p&p. Printed image size 20 cm x 20 cm. 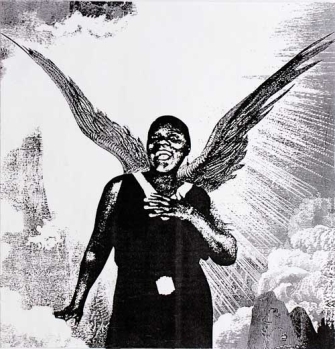 Artwork was done for ‘Straight No Chaser’ which was an influential British music magazine, based in London, which covered various forms of black music and electronic music. Artwork was done for ‘Straight No Chaser’ . The magazine was started by music lover, journalist, and general club-goer Paul Bradshaw, to cover the emerging black music scene that he saw expanding in London and the UK around the time house music hit British shores in a big way around summer 1988. £65 + p&p. Printed image size 43.5 cm x 33.5 cm. 1985. Original is watercolour on paper. The brief that SATB gave us was to get the atmosphere of unease when under water in a crowed pool. Paul Wakefield was the photographer and we used the Y.M.C.A. pool in Tottenham Court road as a location. His underwater camera did not work so he used a Nikon in a plastic bag. I made this painting inspired from one of the photos which were not used from the shoot. Actual size 72 cm x 49 cm. £65 + p&p. Printed image size 41.5 cm x 57 cm. Charcoal and spray-paint on card. This drawing was printed in Vogue ‘News of the Whirl’ section. Original is 83 cm x 114 cm. Old school jazz dance was also known as UK jazz dance refers to the improvised dancing style that originated in the UK in the 1970s. The style grew in clubs in the UK, mainly in London and in northern cities, with the sounds of bebop, Afro-Cuban jazz, fusion, swing and other Latin-influenced jazz and funk. £65 + p&p. Printed image size 40cm x 55 cm. Charcoal and spray-paint on card. 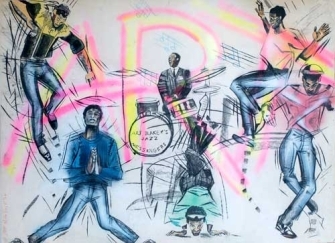 Both these drawings were exhibited in an art exhibition ‘Jazz Dancers’ at the Cuts Gallery, Kensington Church Street in 1984. Original is 80 cm x 110 cm. Jazz dancing predates hip-hop and break-dancing – the American dance culture – which did not reach the U.K. shores until 1982–1983. Jazz dancing has similarities to break-dancing, but essentially it is not the same. £65 + p&p. Printed image size 25cm x 36.5 cm. 1984. Watercolour and montage on card. Featuring; Sean Penn, ZZ top, John Wayne, Roy Rodgers, Jellybean Benitez and the singing cowboy. This painting was commissioned by Lloyd Grossman for the Sunday Times about an article about American culture. 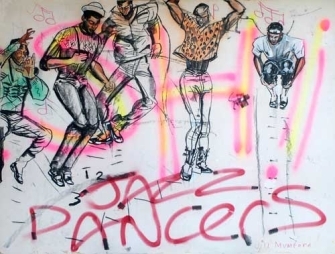 First exhibited at “Jazz dancers” at the Cuts Gallery in Kensington Church Street in 1984. 1984. Watercolour and montage on card. Featuring; From left to right. Little Richard, Jimi Hendrix, James Brown, Michael Jackson, Sheila E, Carl Lewis, Morris Day from the Time. 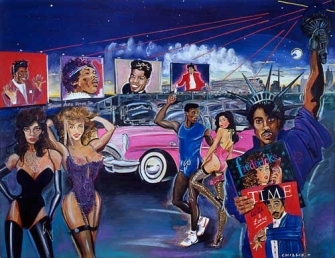 This painting was also commissioned by Lloyd Grossman for the Sunday Times about an article about American culture. First exhibited at ‘Jazz Dancers’ at the Cuts Gallery in Kensington Church Street in 1984. Original is watercolour, montage on card. Dinner guests include: From left. 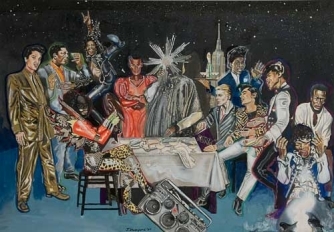 Elvis Presley, John Coltrane, George Clinton (sitting) Sly Stone (flying), Grace Jones, Sun Ra, David Bowie, Little Richard, Bryan Ferry, James Brown, Jimmy Hendrix and Miles Davis. 1984.